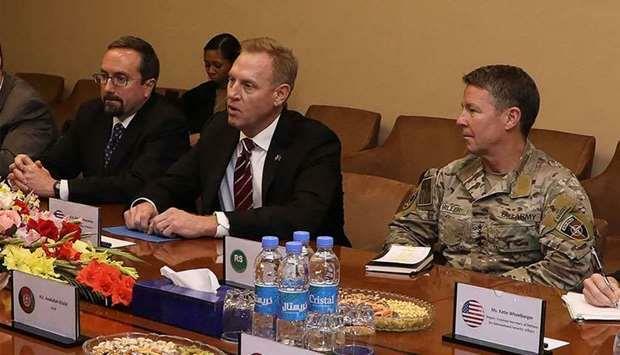 (MENAFN - Gulf Times) The acting US Secretary of Defence Patrick Shanahan arrived in the Afghan capital for an unannounced visit on Monday, meeting with top officials from NATO and the government. ‘Both sides agreed & reassured that the achievements of the past 18 years of the people and the Government of Afghanistan will not go in vain after a possible successful peace deal,' it tweeted. ‘There are no orders to reduce US troop levels in Afghanistan,' he said. There are currently around 14,000 US troops stationed in Afghanistan. A peace deal however would require the Taliban to sit with the Afghan government, whom they have so far denied to meet because the militants consider the Kabul administration a ‘puppet regime.' Ghani has repeatedly invited the militants for talks. Most recently Ghani offered the Taliban an office in Afghanistan, which the militants denied. ‘We can establish an office anywhere we want,' Mujahid said adding that Ghani's comments in this regard was ‘misplaced.' The Afghan war, which erupted in late 2001, has taken the lives of thousands of Afghan civilians.